When Mary Afi Usuah released her sophomore album African Woman on Clover Music in 1978, very few people outside of Nigeria heard the album. That was despite Mary Afi Usuah having performed in front of hundreds of thousands of music fans. Mary Afi Usuah had spent thirteen years touring Europe with some of the biggest names in music. Night after night, Mary Afi Usuah opened for musical luminaries like Deep Purple, Duke Ellington and Led Zeppelin. Sometimes, Mary Afi Usuah took to the stage with Led Zeppelin, and matched Robert Plant every step of the way. This allowed Mary Afi Usuah to showcase her considerable talents and versatility. By then, Mary Afi Usuah was a truly versatile artist. Seamlessly, she could switch between disparate musical genres. Jazz gave way to rock, soul and even opera. That was no surprise. Growing up in Nigeria, music had played an important part in Mary Afi Usuah’s life. She played guitar from an early age, and growing up, began to write her own songs. These songs Mary Afi Usuah would record. However, the life of a singer-songwriter wasn’t for Mary Afi Usuah. Instead, Mary Afi Usuah harboured dreams of being an opera singer. So having left high school, Mary Afi Usuah dared to dream and left her her home in Nigeria to train as an a opera singer. Over the next few years, Mary Afi Usuah studied in London, Naples and at the prestigious St. Cecilia Academy in Rome. Despite her dedication, and the time she spent studying to become an opera singer, Mary Afi Usuah’s future lay elsewhere. That was how Mary Afi Usuah came to spend thirteen years touring with the great and good of music. During that period, Mary Afi Usuah’s embarked upon a career as a recording artist. Her recording career began in 1969, when Mary Afi Usuah released her debut single Molto Di Più on the Italian label, Cinemox. The single wasn’t a commercial success, so Mary Afi Usuah continued to concentrate on live work. Two years later, in March 1971, Mary Afi Usuah released another single on Cinemox, Kiss Me. It was a familiar story, when the single failed commercially. By then, Mary Afi Usuah’s star was in the ascendancy, and she was touring with some of the biggest names in music. For the next few years, Mary Afi Usuah spent much of her time on what was a never ending tour. It would eventually last thirteen years. Still, though, she would find time to return to her native Nigeria, where she played live and recorded her debut album Ekpenyong Abasi. Accompanying Mary Afi Usuah on Ekpenyong Abasi, were The South Eastern State Cultural Band. They recorded what was an eclectic album, which features Afrobeat, jazz, folk, funk and rock. Ekpenyong Abasi was released on the SESCULT label in 1975, and was credited to Ekpenyong Abasi with The SES Cultural Band. Belatedly, one of Nigerian music’s most tainted vocalists, Mary Afi Usuah had released her debut album. Surely she would soon, return with the followup. After a gap of three years, Mary Afi Usuah began work on a new album, African Woman. For her new album, Mary Afi Usua had written eight now songs, and would be accompanied by Akwassa, who were a talented and versatile band. Akwassa were one of many Nigerian bands who were making a living in the country’s nightclubs. However, Akwassa, who sometimes performed as Heads Funk Band, were a cut above the competition. Their lineup featured Awassa Eddy Offeyi, Felix Odey, Joe Castro, Kevin “Coburn” Njoku and Ricky West. They were joined by a very special guest artist, lead guitarist Charles “Effiom” Duke. His addition was the finishing touch to a truly talented band. They joined Mary Afi Usuah in the studio. Recording took place at Phonogram Studios, Ikeja, Lagos. When work began on African Woman, Felix Odey, Joe Castro and Sylvester Akaiso had arranged the eight songs. They were co-produced by Sylvester Akaiso. He watched as Mary Afi Usuah and her multitalented band recorded the eight tracks. Seamlessly they switched between and sometimes combined, disparate musical genres. This included Afrobeat, disco, folk, funk, jazz, rock and soul. 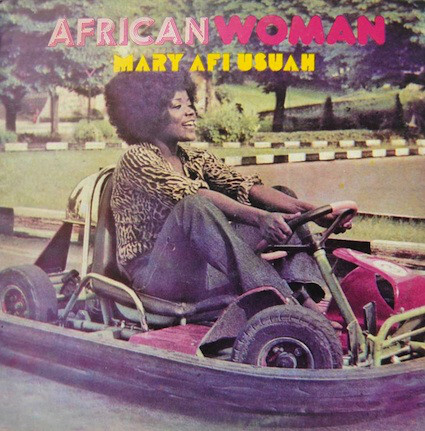 African Woman was even more eclectic than Mary Afi Usuah’s debut album. When it was completed, it was released later in 1978. African Woman, which was recently released by PMG, was released in 1978 on Clover Sound. Alas, African Woman failed to find an audience, and the album disappeared without trace. This was a huge blow to Mary Afi Usuah. Maybe then, she knew her dream was over? It shouldn’t have been, given the quality of music on African Woman. 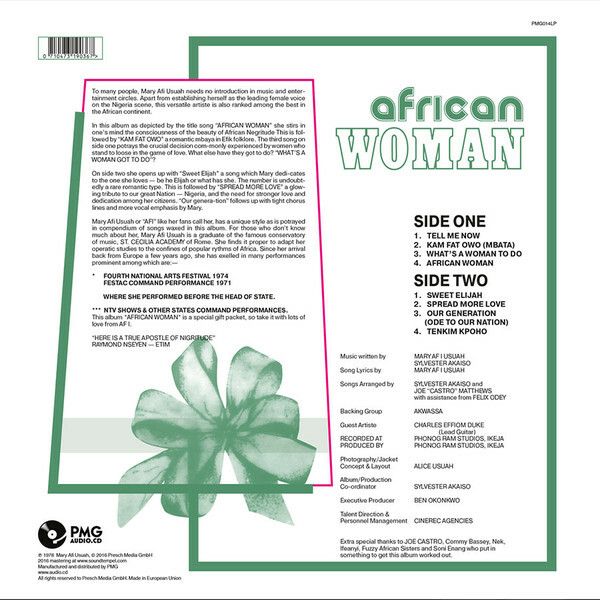 The title-track opens African Woman. A chiming guitar dances across the arrangement, before a roll of drums signals the arrival of the rhythm section and Mary Afi Usuah’s powerhouse of a vocal. She’s accompanied by backing singers, who accompany Mary every step of the way. Behind her, Akwassa lay down a tight groove, fusing elements of funk and rock. Later, Mary’s vocal grows in power and becomes celebratory and full of pride. There’s even a nod to the Queen of Soul, Aretha Franklin, as this proud African Woman, Mary Afi Usuah, sets the bar high for the rest of the album. As Kam Fat Owo (Mbata) unfolds, drums crack and roll, while the bass and chiming guitar usher in Mary’s vocal. She has eschewed power, for a much more soulful vocal. Soon, washes of Hammond organ join percussion, the rhythm section and guitar. By then, Mary isn’t holding back, and is combining power with soulfulness. That’s until a rasping horns makes a brief and welcome appearance. It reappears, and is played subtly as it accompanies Mary as she combines soul and jazz, on a track where Afrobeat, funk and jazz are combined by Akwassa. They again, showcase their versatility and prove the perfect foil for Mary Afi Usuah. Chirping, funky guitar licks open What’s A Woman To Do, before the rhythm section and Hammond organ create the backdrop for Mary’s vocal. It’s a mixture of power, frustration and anger, as she seems to draw inspiration from Tina Turner. There’s even a nod to James Brown as she briefly vamps, before her band up the funk factor. A funky bass plays a leading role in the sound and success of the arrangement. So do braying, blazing horns as Mary’s soul-baring vocal literally oozes emotion and frustration. Crystalline guitars open Tell Me Now and are joined by a funky rhythm section and percussion. They combine with Mary’s sassy, joyous vocal on this celebratory sounding backdrop. By then, a whistle punctuates the arrangement, and keyboards have locked into a groove with the rhythm section and horns. Later, Mary’s vocal becomes a jazzy vamp, as she moves away from her soulful stylings. She ad-libs as her vocal becomes needy and hopeful as the arrangement meanders along towards a crescendo. That’s when Mary asks: “tell me now do you love me?,” on this joyous, funky, soulful and jazz-tinged song. On Sweet Elijah, the tempo drops, and Mary is joined by cooing harmonies as she mixes soul and gospel. Meanwhile, the arrangement is understated, with the rhythm section, a chiming guitar and percussion combining. Mary’s vocal is a mixture of power and passion, as she testifies. Matching her every step of the way, are the backing vocalists. They add the finishing track to what’s a quite beautiful song. The rhythm section are at the heart of the action on Spread More Love. Especially the bass. They’re joined by keyboards as Mary delivers a heartfelt vocal, on what’s a song with a message. A horn responds to her call, while the rhythm section and keyboards anchor the arrangement. Later, as Mary delivers her ‘message’ it’s Akwassa respond to her call. By then, her vocal has grown in power. Then when it drops out, a sultry saxophone proves the perfect replacement. Then the saxophone takes its leave, Mary scats, before unleashing another vocal powerhouse. She sing: “Spread More Love,” while Akwassa respond: “spread it now,” on what’s a soulful, jazz-tinged ballad. .The rhythm section have joined with keyboards and percussion to provide the backdrop for Mary on Our Generation (Ode To Our Nation). Soon, she is combining power and passion, as backing vocalists respond to her call. Then when her vocal drops out, Akwassa get the opportunity to shine. They show that they’re a talented and versatile band, as they Afrobeat and funk. By the time, Mary returns, Akwassa have locked into the tightest of grooves. She delivers an impassioned vocal, as if desperate to get her message across. Tenkim Kpoho closes African Woman, where the rhythm section, keyboards and guitar combine as Mary’s vocal is akin to a vamp. Soon, though her vocal veers between sassy and soulful, while backing vocalists accompany her. Behind her, Akwassa produce one of their best performances. They seem to have more chance to showcase their considerable talents. Washes of Hammond organ, keyboards and a chiming, searing guitar play leading roles as the rhythm section anchor the arrangement. By then, Mary is combining soul, sass and jazz as this African Woman takes her leave. After eight tracks lasting thirty-seven minutes, African Woman is over. It features a truly underrated singer-songwriter Mary Afi Usuah. She was one of the most talented female singers in the history of Nigerian music. Some believe there was none better, and indeed, one of the finest singers the African continent ever produced. Despite Mary Afi Usuah’s undoubtable talent, her recording career was all too brief. It amounted to just a couple of singles and two solo albums. This includes African Woman, which when it was released in 1978, passed record buyers by. It was no wonder that with just a few years, Mary Afi Usuah had turned her back on music, and decided to work for the Nigerian Ministry of Culture. Never again, did Mary Afi Usuah return to the recording studio. Sadly, in 2013, Mary Afi Usuah passed away. By then, there had been a resurgence in interest in her music. The only problem was, original copies of the album are almost impossible to find. When a copy becomes available, the prices are usually beyond the pocket of most music fans. So it made sense to reissue African Woman. For anyone who has even a passing interest in African music, then the reissue of Mary Afi Usuah’s African Woman should be a cause for celebration. The reissue of African Woman is an opportunity to discover one of the greatest female vocalists in the history of African music, Mary Afi Usuah. She is accompanied by Akwassa, who provide the backdrop for Mary Afi Usuah, as she showcases her talent and versatility on African Woman, a true hidden gem of Nigerian music. ← KING CREOSOTE-ASTRONAUT MEETS APPLEMAN.